Huge banking bonus due to five year-old girl "rainmaker" Tia? There have been a number of cases in which people with no financial expertise have been pitted against financial investment experts, to see how well they fare on the stock exchange. Here's one example from 2002 (scroll down - it's the only one I could find on basis of a quick search). Of course this, by itself, is merely anecdotal evidence that the supposed skills of stock market gurus are largely mythical. In this example, a financial analyst, using his expertise and computer analysis, lost 46.2%, over the year while five year old Tia's portfolio, picked at random, jumped 5.8%. Even the astrologer investing on the basis of planetary movements did significantly better than the supposed financial expert. Be interested to hear of more examples (can't find any at the moment, though I've certainly stumbled upon a few in the past) or of any evidence to the contrary. Does anyone have more information or examples? Most importantly of all, Tia would now become what's known as a "rainmaker", attracting wealthy investors. And her increasingly large investments might now tend to outperform others. Why? Because other investors would now tend to follow her lead, thus causing her randomly generated guesses as to what stock will rise to actually come true. So Tia's predictions might tend to become more accurate. And yet she's a five year old girl with no financial skill whatsoever. A five-year-old girl is still beating the stock market and financial experts after randomly picking shares. Tia Roberts took part in an experiment last year to compare different ways of predicting the stock market. The experiment pitted Tia against financial astrologer Christeen Skinner and independent analyst Mark Goodson. 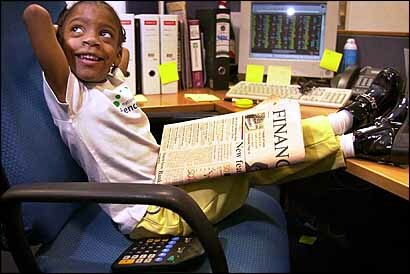 Each invested a virtual £5,000 in a fantasy portfolio during National Science Week 2001, with Christeen choosing stocks based on the movement of the planets and Mark using his expertise and computer analysis. Tia, who picked her stocks at random by grabbing numbered notes representing each company in the FTSE 100 Index, won last year's competition as her shares performed best during National Science Week. The test of time shows Tia is still a winner, with her portfolio the only one to gain value a year later. Tia's portfolio is up 5.8% one year on; while Christeen's is down 6.2%; and Mark's selections have fallen by 46.2%. During the year, the FTSE 100 Index has dropped 16%. Continues at ananova. Post Script: also just found the following opinion, for what it's worth. I wonder what studies are being referred to? I have often heard it said, but have not really looked into it before: "The reality is that luck and not skill explains outperformance by fund managers. Many studies conclusively demonstrate this fact. Neither Ms. Ralbovsky nor anyone else can help you find the next lucky quant fund manager." Go to "The Myth of The Stock Market Guru" by Dan Solin here. Another experiment to confirm that a dart board or a monkey is just as good as well in the random market. Just another confirmation how the merchant/investment bankers are overpaid for contributing nothing to the economy. Hmmmm. It's a bit more complicated than that Stephen. You would do well to read 'Fooled by Randomness', by Nassim Nicholas Taleb. I have a pretty low opinion of most fund managers (which is why i don't invest in funds) but just because a fund has performed badly doesn't mean it has been poorly managed. eg A and B have 10,000pounds to save for a pension. A's idea is to spread his money over a wide range of investments (this is essentially what you pay funds to do for you) thus minimising the risk of losing all of it, and increasing the chance that a substantial part of it will do very well. B's idea is to buy about 200 lottery tickets a week. one year later A's portfolio has lost a good deal of its value and B has won the lottery. Would you really say that B's idea had been a sensible one? or that B deserves praise? or that A deserves blame? As I say this is merely anecdotal evidence. However, I think it was designed to illustrate something that is actually well established, that those who play the stockmarket in this way do no better than someone picking at random. My final quote alludes to such studies but I haven't got any references and would like some. Of course the relevance of this to the current enormous bonuses being paid to bankers is obvious. I mean they generally do no better on average than those picking at random. Some will get lucky and do better, like Tia, and some will do worse. As I say, I think this is fairly well established. The lesson to draw from this and similar results is to not put your money in managed funds. However, it has not disproved the efficient market hypothesis that the market takes into account all available information in prices. I.e. most things are priced rationally, and it's hard to make better guesses than the market aggregate, and if someone can outguess the market aggregate, it's hard to identify them in advance. You have not shown that the banking sector (the whole thing?) is a scam. No one actually working in the field would talk about "stock market gurus". It's true that someone might have a flawed business plan which makes them a massive profit and bonus 19 years out of every 20, but loses money overall. Their strategy would appear to work for a long time despite being unsound. The solution to that is simply to ban maturity transformation (http://unqualified-reservations.blogspot.com/2008/09/maturity-transformation-considered.html) and then never bail out banks again.